Home › British Week › British Week 2016: The Mackay School celebrates its British Heritage! Esta semana, nos sentimos orgullosos de haber sido partícipes de las significativas y entretenidas actividades que el Departamento de Inglés organizó para el deleite de nuestros profesores y alumnos. 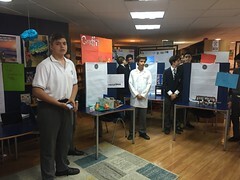 Siendo el colegio Británico más antiguo de Chile, sentimos el deber y el orgullo como institución de regocijarnos en nuestra herencia cultural e histórica. Nuestra comunidad comenzó su jornada y la semana encontrando a su colegio vestido de hermosas banderas del Reino Unido. Es impactante cómo nuestro edificio cambia su fachada e impronta con sólo este detalle. De por sí es una tonalidad distinta y un adelanto de lo que viene, y nuestra comunidad lo siente de esa manera. ¡Un sentido de emoción comienza a crecer en los corazones de nuestros alumnos y profesores! En períodos de clase entre 6to y 1ero Medio, comenzamos una entretenida actividad llamada “LipDub”. Escogimos canciones del top 10 de radios de UK, y les propusimos a nuestros cursos hacer un entretenido video generacional donde los alumnos “doblarían” las canciones y aprovecharían de mostrar su colegio. La primera etapa consistió en construir atractivos visuales para acompañar la coreografía. El trabajo continuaría el resto de la semana. ¡La generación que resulte con el video ganador (sujeto a votación por todos los cursos de Junior y Senior) disfrutará de una sesión de Pizza para todos! En la hora de almuerzo, nuestra comunidad disfrutó del delicioso plato tradicional Británico Fish and Chips. Al mediodía, un grupo de alumnos de los cursos 6A, 6B, 7A, 7B, 7C, 8A, 8B y 8C compitieron en una entretenida carrera del saber. ¿La idea? Responder unas entretenidas preguntas relacionadas a su conocimientos sobre la cultura Británica y nuestro querido colegio. Con mucho entusiasmo, ellos corrieron hacia distintos puntos dentro de nuestro colegio encontrando las pistas que los llevarían más cerca de un preciado tesoro. Con mucho orgullo nuestros niños cantaron el himno Británico para completar una respuesta y de manera muy rápida recordaron el pasado de nuestro colegio en la ciudad de Valparaíso. ¿Quiénes encontraron el tesoro? Es una sorpresa que entregaremos al cierre de esta semana de celebración. Nuestro querido cuerpo de profesores disfrutó de una deliciosa sesión de la tradición Británica “5 o’clock tea” antes del Consejo de Profesores. Scones con mermelada y crema fueron los favoritos de la jornada. ¡Sin duda este encuentro quedará en la memoria de muchos de nosotros! 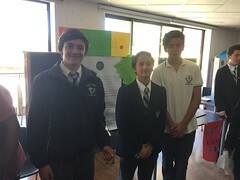 Una selección de los alumnos más destacados de 8vo básico disfruto del tradicional “Valpo Tour” liderado por el profesor de Inglés y Head of Year Mr Julio Uribe, junto a las profesoras Verónica Cordero, Meghan Crawford y Miss Ana María Ortiz. Juntos recorrieron los pasajes más significativos en Cerro Alegre relacionados con la historia de The Mackay School, entre ellos el Cementerio de Disidentes, el Centro Cultural Balmaceda donde estuvo alguna vez ubicado el colegio, para culminar con una trivia y un tradicional almuerzo en el restaurant “Mastodonte” en el centro de Valparaíso. 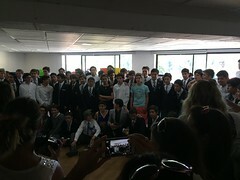 El último día de British Week tenía que ser memorable. Nuestros alumnos de la banda del colegio Matías Mujica, Ignacio Ruiz, Joaquín Ruiz, Sebastián Reitze y Tomás Santelices, dirigidos por el profesor Oscar Espinoza, realizaron una presentación memorable con canciones icónicas de la cultura Británica, de grupos tales como The Cure, The Beatles, Muse y Coldplay. Todos fuimos sorprendidos por la calidad vocal y lo superior del espectáculo. Alrededor de la 1 de la tarde, dimos paso a lo que todos esperaban. Mauricio Torres, doble oficial de Freddie Mercury en Chile, realizó su asombrosa presentación personificando al líder de la icónica banda Queen. Mauricio fue finalista de los programas MI NOMBRE ES de Canal 13 y TALENTO CHILENO de CHV. Ha recorrido todo Chile con su show, presentándose en los más importantes escenarios a lo largo del país. El próximo mes de Mayo presentará su espectáculo en la televisión brasilera. Sin duda, este día será recordado por todos nosotros como el gran cierre de nuestra British Week 2016! This week, we’re feeling proud to have participated in the important and entertaining activities that the English Department organised for the enjoyment of our teachers and students. Being the oldest British school in Chile, we feel that it is our duty as an institution to rejoice in our cultural heritage and history. Our community began the festivities of the week by finding the school decorated with the UK flag. Seeing how the school’s façade is transformed by adding a splash of Red, White, and Blue is truly impacting. The hanging of dozens of flags is a signal of what’s to come, and it evokes feelings of excitement and anticipation in the hearts of our students and teachers! In English classes with 6th grade and 1st Medio, we began the entertaining “LipDub” activity. We chose songs from the top 10 radio of the UK, and we proposed to our courses the idea of creating a video with the entire generation, “dubbing” the songs and showing off the school. The first phase consists of creating eye-catching visuals that accompany the choreography. The task continued throughout the week, with many trials, costumes, props, and laughs. The generation that wins the title of best video, subject to the vote of all courses from Junior and Senior, will enjoy a delicious PIZZA PARTY! For lunch this day, teachers and students alike enjoyed a delicious, traditional serving of British Fish and Chips. During the second recess, selected students from 6A, 6B, 7A, 7B, 7C, 8A, 8B, and 8C competed in a high-energy, knowledge-based task. The idea? Respond to trivia questions based on British and ‘Mackayan’ history. 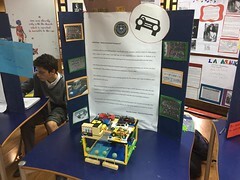 With loads of enthusiasm and teamwork, the students ran to different places in the school according to the hints given, leading them to the treasure at the end. With pride, the students had to sing part of the British National Anthem to complete one answer, while remembering the history of The Mackay School for another. We would like to congratulate the form class of 8A for winning the prize this year! Great work in the treasure hunt! Our beloved group of teachers from the Senior School enjoyed a delicious “5:00 Tea” before an important meeting, consisting of fresh scones with jam and whipped cream- a traditional British treat! Without a doubt, this Tea Time was a great success, changing the routine of coffee and cookies at meetings, and we definitely won’t forget it! A group of outstanding 8th grade students thoroughly enjoyed our traditional “Valpo Tour,” lead by English Teacher and Head of Year Julio Uribe, together with teachers Verónica Cordero, Meghan Crawford, y Ana María Ortiz. Together, they visited the most significant places in Cerro Alegre related to the history of The Mackay School, among them the Cemetery of Dissidents, The Balmaceda Cultural Centre where the school was once located, and the Somerscales Hotel Boutique. 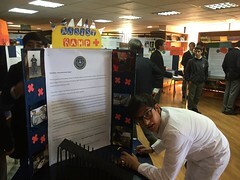 We mustn’t forget that this was an educational field trip, for which students took a quiz based on what they learned, all while eating a traditional lunch of Chorrillana in the “Mastodonte” Restaurant in Valparaiso; the student with the highest score received a free ice cream cone from the famous Emporio La Rosa! The last day of British Week had to be the most memorable. 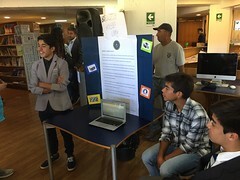 The students from the school band, Matías Mujica, Ignacio Ruiz, Joaquín Ruiz, Sebastián Reitze, and Tomás Santelices, directed by Music Teacher Oscar Espinoza, played a set of memorable songs by iconic British bands, such as The Cure, The Beatles, Muse, and Coldplay. The vocal quality and showmanship of their set was spectacular, though not surprising, coming from these extremely talented students. Around 1:00 in the afternoon, the moment we had all been waiting for finally arrived. Mauricio Torres, the offical Freddie Mercury double of Chile, put on an amazing presentaion, personifying the lead singer of the iconic British band, Queen. Mauricio was a finalist in the programs Mi Nombre Es on Canal 13 and Talento Chileno on CHV. He has travelled the whole length of Chile, performing on the most important stages of our country. Next month, he will present his show on Brazilian television! Without a doubt, this day will be remembered by all as an amazing closing ceremony to British Week 2016!